Identification: In general, cichlids (Cichlidae) are superficially similar to sunfishes and black basses (Lepomis and Micropterus; family Centrarchidae). Cichlids can be distinguished from centrarchids by a single nostril opening on each side of the head (vs. two openings in centrarchids) and the presence of a discontinuous or two-part lateral line (vs. a continuous lateral line in centrarchids). Distinguishing characteristics of spotted tilapia were presented in Taylor et al. (1986) and Page and Burr (1991). Photographs were given by Axelrod et al. (1985), Taylor et al. (1986), and Axelrod (1993). Illustrations were provided by Courtenay and Hensley (1979b), Lee et al. (1980 et seq. ), and Page and Burr (1991). Spotted tilapia is similar to another North American introduced cichlid, redbelly tilapia Tilapia zillii: spotted tilapia lacks the deep red ventral coloration present in T. zillii, has lateral vertical stripes that extend onto the dorsal fin, and 5-6 square black blotches along the side (lacking in T. zillii). Native Range: Tropical Africa. West Africa from middle Ivory Coast to southwestern Ghana and from southeastern Benin to southwestern Cameroon (Thys van den Audenaerde 1966; Philippart and Ruwet 1982). Table 1. States with nonindigenous occurrences, the earliest and latest observations in each state, and the tally and names of HUCs with observations†. Names and dates are hyperlinked to their relevant specimen records. The list of references for all nonindigenous occurrences of Tilapia mariae are found here. Ecology: This species is generally a benthic herbivore, with algae, diatoms, detritus, and aquatic macrophytes representing the major portion of its diet (~85%) and terrestrial insects and benthic invertebrates comprising a small fraction (~5%) (Fagade 1971; Ikomi and Jessa 2003). However, in southern Florida, anglers also take it using worms and small shrimps. Spotted tilapia are substrate spawners that exhibit biparental care of offspring (Whitehead and Trewavas 1963; Schwanck 1989), with reproduction in tropical areas occurring year round with seasonal peaks dependent on local climate (Ikomi and Jessa 2003; King and Etim 2004). Means of Introduction: Spotted tilapia was introduced into Florida as a result of escapes or intentional releases from one or several aquarium fish farms in Dade County, probably between 1972 and 1974 (Hogg 1974, 1976a, b; Courtenay and Hensley 1979b; Courtenay and Stauffer 1990). The Nevada introduction was reportedly due to an aquarium release (Courtenay and Deacon 1982, 1983; Courtenay and Stauffer 1990). Status: Established in Florida; reported from Arizona and Nevada. Uncertain in Texas. Impact of Introduction: This apparently aggressive species is the dominant fish in many canal systems of southeastern Florida and has the potential to affect other introduced and native fishes (Courtenay and Hensley 1979b). Spotted tilapia is bolder and more aggressive than Lepomis sunfishes, which can reduce potential spawning habitat for native sunfishes and likely enhances the tilapia's invasion potential and establishment success (Brooks and Jordan 2010). In Nevada, T. mariae was reportedly the dominant fish in Rogers Spring and there was concern that this omnivorous cichlid competed with endemic spring fishes for food and also preyed on smaller fishes (Courtenay and Deacon 1982, 1983). Bradford et al. (2011) reviewed the biology and management of this species in native and introduced regions. 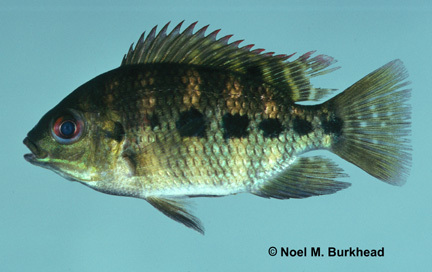 Remarks: Since the early 1970s, Tilapia mariae has rapidly dispersed in south Florida, where it has gradually replaced black acara Cichlasoma bimaculatum as the most abundant cichlid in area canal systems, possibly through competition for space (Courtenay and Hensley 1979a, 1979b; Kushlan 1986; Loftus and Kushlan 1987). Possession of this species in Florida has been banned since 1974 (Clark 1981). A portion of a population found in a borrow pit in Perrine, Dade County, Florida, included hybrids with redbelly tilapia Tilapia zillii (Taylor et al. 1986). Distribution maps for Florida records were given by Hogg (1976b), Courtenay and Hensley (1979b), Lee et al. (1980 et seq. ), Clark (1981), Kushlan (1986), and Loftus and Kushlan (1987). The conclusion by some authors that this species was introduced into and is possibly established in Arizona apparently is based entirely on Minckley's (1973) presentation of a photograph of Tilapia mariae (incorrectly identified as "Tilapia nilotica") in his book on Arizona fishes. Minckley also described young tilapia that more closely matched T. mariae as opposed to Tilapia nilotica (= Oreochromis niloticus) (see Courtenay and Hensley 1979b; Courtenay et al. 1984, 1986). However, the conclusion that T. mariae was ever present in Arizona assumes that the specimens photographed and examined by Minckley actually were collected in Arizona. Spotted tilapia has been listed as present in the Salton Sea, Colorado River, and Los Angeles area in California; however, there are no substantiated records for that state (i.e., museum specimens), and this species likely has never been introduced there and these represent misidentifications of redbelly tilapia T. zillii. Northward expansion of spotted tilapia is likely limited by its lower limit of cold temperature tolerance (~11°C; Shafland and Pestrak 1982). Voucher specimens: Florida (NCSM 27426, 29044, 29062, and others; UF 30875, 90534, 91946, 92171, 92187, and many others; IRCZM 107:5295, 107:5296, 107:5297, 107:5442, 107:5443, 107:5444, 107:05634); Nevada (UF 175064, 176938); Texas (TNHC 24588). Bradford, M., F.J. Kroon, and D.J. Russell. 2011. The biology and management of Tilapia mariae (Pisces: Cichlidae) as a native and invasive species: a review. Marine and Freshwater Research 62:902-917. Brooks, W.R., and R.C. Jordan. 2010. Enhanced interspecific territoriality and the invasion success of the spotted tilapia (Tilapia mariae) in South Florida. Biological Invasions 12:865-874. Clark, M.R. 1981. Probable establishment and range extension of the spotted tilapia, Tilapia mariae Boulenger (Pisces: Cichlidae) in east central Florida. Florida Scientist 44(3):168-171. Courtenay, W.R., Jr. 1989. Exotic fishes in the National Park System. 237-252 in L. K. Thomas, ed. Proceedings of the 1986 conference on science in the national parks, volume 5. Management of exotic species in natural communities. U.S. National Park Service and George Wright Society, Washington, DC. Courtenay, W.R., Jr., and D.A. Hensley. 1979a. Survey of introduced non-native fishes. Phase I Report. Introduced exotic fishes in North America: status 1979. Report Submitted to National Fishery Research Laboratory, U.S. Fish and Wildlife Service, Gainesville, FL. Courtenay, W.R., Jr., and D.A. Hensley. 1979b. Range expansion in southern Florida of the introduced spotted tilapia, with comments on environmental impress. Environmental Conservation 6(2):149-151. Courtenay, W.R., Jr., and J.R. Stauffer, Jr.. 1990. The introduced fish problem and the aquarium fish industry. Journal of the World Aquaculture Society 21(3):145-159. Courtenay, W.R., Jr., D.A. Hensley, J.N. Taylor, and J.A. McCann. 1984. Distribution of exotic fishes in the continental United States. 41-77 in W. R. Courtenay, Jr., and J. R. Stauffer, Jr., eds. Distribution, biology and management of exotic fishes. Johns Hopkins University Press, Baltimore, MD. Fagade, S.O. 1971. The food and feeding habits of Tilapia species in the Lagos Lagoon. Journal of Fish Biology 3:151-156. Hogg, R.G. 1974. Environmental hazards posed by exotic fish species newly established in Florida. Environmental Conservation 1:176. Ikomi, R.B., and H.O. Jessa. 2003. Studies on the aspects of the biology of Tilapia mariae (Boulenger, 1899) (Osteichthyes Cichlidae) in Ethiope River, Niger Delta, Nigeria. African Zoology 38(2):255-264. King, R.P., and L. Etim. 2004. Reproduction, growth, mortality and yield of Tilapia mariae Boulenger 1899 (Cichlidae) in a Nigerian rainforest wetland stream. Journal of Applied Ichthyology 20:502-510. Kushlan, J.A. 1986. Exotic fishes of the Everglades: a reconsideration of proven impact. Environmental Conservation 13:67-69. Loftus, W.F., and J.A. Kushlan. 1987. Freshwater fishes of southern Florida. Bulletin of the Florida State Museum of Biological Science 31(4):147-344. Philippart, J.-Cl., and J.-Cl. Ruwet. 1982. Ecology and distribution of tilapias. 15-59 in R.S.V. Pullin, and R.H. Lowe-McConnell, eds. The biology and culture of tilapias. ICLARM conference proceedings 7, International Center for Living Aquatic Resources Management, Manila, Philippines. Schwanck, E.J. 1989. Parental care of Tilapia mariae in the field and in aquaria. Environmental Biology of Fishes 24(4):251-265. Shafland, P.L., and J.M. Pestrak. 1982. Lower lethal temperatures for fourteen non-native fishes in Florida. Environmental Biology of Fishes 7(2):149-156. Taylor, J.N., D.B. Snyder, and W.R. Courtenay, Jr. 1986. Hybridization between two introduced, substrate-spawning tilapias (Pisces: Cichlidae) in Florida. Copeia 1986:903-909. Thys van den Audenaerde, D.F.E. 1966. Les Tilapia (Pisces, Cichlidae) du Sud-Cameroun et du Gabon étude systématique. Annales Du Mussee Royale de l'Afrique Centreale (Sciencs Zoologiques) 153:1-98. Whitehead, R.A., and E. Trewavas. 1962. The life history and breeding habits of the west African cichlid fish Tilapia mariae and the status of T. meeki. Proceedings of the Zoological Society of London 139:535-543.